This semi detached cottage dates back to 1900 and has been fully renovated and modernised to offer cosy well equipped holiday accommodation. 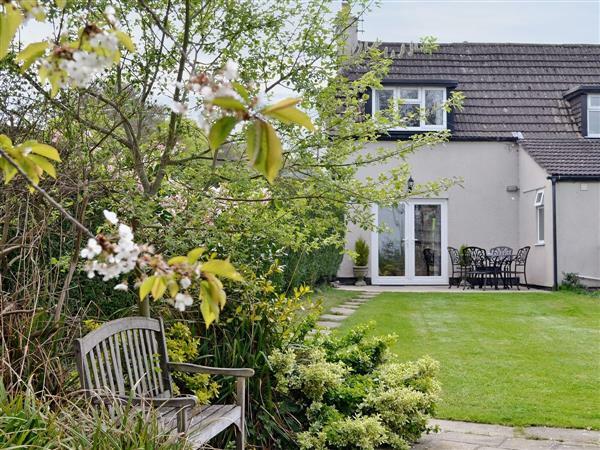 In a quiet location on the edge of the village, it is an ideal area for walking and a great base for touring the Wiltshire and Somerset countryside. The famous Lacock village is popular with film producers for its olde worlde charms, and is only 5 miles away. Bowood House and Lydiard House are spectacular mansions with parks and gardens, and the Westonbirt Aboretum is one of the UK’s best. Castle Combe is also nearby and is often voted the prettiest village in Britain, as well as having the famous racing track. Shop 4 miles, pub and restaurant 3 miles. Ground floor: Living room with patio door/dining room/kitchen with wooden floor. Shower room with toilet. First floor: 2 bedrooms: 1 double, 1 twin with additional single folding bed. Woodburner in living room (initial fuel included). Oil central heating, electric, bed linen and towels included. Cot. High-chair. DVD and small library. Electric cooker. Microwave. Washing machine. Dish washer. Freezer. Enclosed lawned garden with patio and furniture. Portable Barbeque. Parking (2 cars). Shared swimming pool. No smoking please. Holidays at Brenham Cottage run from Saturday to Saturday. For a better idea of where Brenham Cottage is, you can see Brenham Cottage on the map below. Brenham Cottage is in Wiltshire; should you be on the lookout for a special offer, you can find all the special offers in Wiltshire. It's always worth checking to see what is on offer at the moment. Do you want to holiday near Brenham Cottage (W41515), you can see other cottages within 25 miles of Brenham Cottage; have a look to find your perfect holiday location.